According to the Chronic Kidney Disease prognosis consortium (CKD-PC), 1 in 4 patients >65 years-of-age, have some form of chronic kidney disease (CKD) and, 3 in 100 progress to kidney failure. The aim of this study is to demonstrate the effect of bariatric surgery in the progression of CKD to kidney failure. Patients who underwent bariatric surgery in the last 6 years were retrospectively reviewed. Kidney function and injury were assessed using estimated glomerular filtration rate (eGFR) and Urinary albumin-to-creatinine ratio (uACR) average value, at a 3-month-interval pre-operatively and at 12 months follow-up. 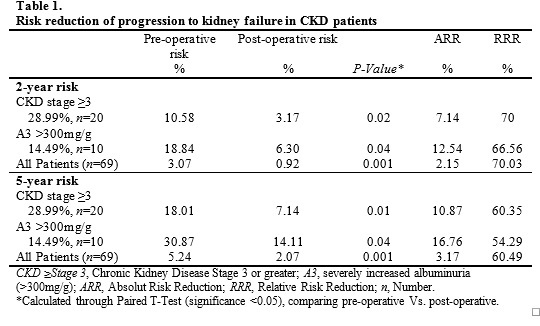 The risk of progression from CKD to kidney failure was assessed using the CKD-PC equation. Of the 2,924 patients reviewed, 2.35% (n=69) had the required variables to assess kidney injury and risk of progression to kidney failure. The greatest improvement in kidney injury was observed in the most advanced stages of CKD, evidenced by a 70.3% decrease in uACR at 12 months follow-up (121mg/g, p=0.0154). These results correspond to a Relative Risk Reduction of 70.03% and 60.49% at 2 years and 5 years respectively, in the progression to kidney failure in CKD patients (p=0.001, p=0.001). Bariatric surgery improves kidney injury in the most severe stages of CKD. This represents a remarkable risk reduction in the progression from CKD to kidney failure at 2 and 5 years.